We sit through award show after award show, and while we love the idea of winners and losers, golden statues of various objects, red carpet pre-show and celeb gossip post show, we still find we are always complaining about something – well at least I am. It is too long, it is too boring, the red carpet fashion was ugly, my sandwich tasted bad (not really their fault but I’m on a roll) and on and on I go. 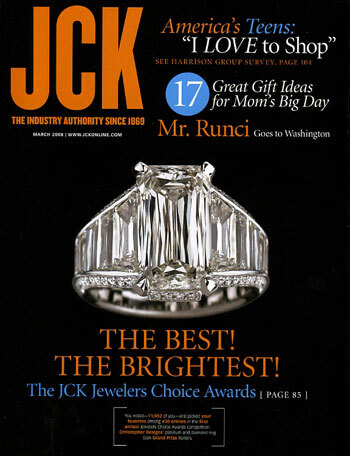 Well the ultimate answer is here: JCK’s 1st Annual Jeweler’s Choice Award. Why we love it: you control the speed at which you flip the pages, no boring speeches, the gold is in the form of beautiful jewelry and not globes or naked men, it is all about jewelry - which is what I really look for on the red carpet anyways, and it showcases some of the most brilliant and exquisite designs out there. Pick up the March issue of JCK to see the winners or check it out online! Of course, we tend to be a little biased, so we want to extend our congrats to the following LupRocks.com members who all won in their respective categories. MaeVona won for best bridal design in the $2,500 and under category. Gumuchian won for best journey diamond jewelry design in the over $5000 category. Frank Reubel Designs won for best necklace design in the $2,501 - $5,000 category. Marya Dabrowski won for best ring design in the $2,501 - $5,000 category and for best pearl design in the over $7,500 category. Yael Designs won for best pearl design in the $2,500 and under category. Erica Courtney won for best platinum jewelry in the over $10,000 category. Congrats to everyone, and to Blumlux and Amgad, who also had placements in this month’s issue of JCK!